According to AA, these increases will coincide with a likely increase to fuel prices in March. Toll fees across South Africa will increase again on 1 March, adding yet more financial pain to already embattled consumers. The Automobile Association (AA) says these increases will co-incide with a likely increase to fuel prices in March, which, given the current data, look set to be significant. These increases will apply country-wide to all tolled roads. “With the increase to fuel levies which comes into effect in April, the addition of a Carbon Tax on fuel (effective in June), the likely increase to fuel prices in March, and, now, the increase to toll fees across the country, consumers will see their money diminish even more,” notes the Association. The AA says while the tolls for the Gauteng Freeway Improvement Project (GFIP) are increasing in line with inflation, this will be of little solace to consumers who have either not received increases to their wages and salaries or whose increases have either been in line with or lower than that. “It may be convenient to keep increases in line with inflation from a messaging perspective but the reality is that multiple increases to taxes, levies and tolls will have a cumulative effect. Consumers who are already struggling to make ends meet in our fragile economy will be even more hard-pressed now with the result that many may be forced to make decisions on whether to continue paying for e-tolls.. The South African National Roads Agency (SANRAL) may not like the outcome of these decisions,” says the AA. This, the AA notes, is especially important given SANRAL’s admission in Parliament in 2017 that the compliance rate for e-toll users on GFIP is only around 30%. “We again call on SANRAL to engage in a meaningful dialogue with the motoring public in Gauteng instead of simply increasing its tolls annually. 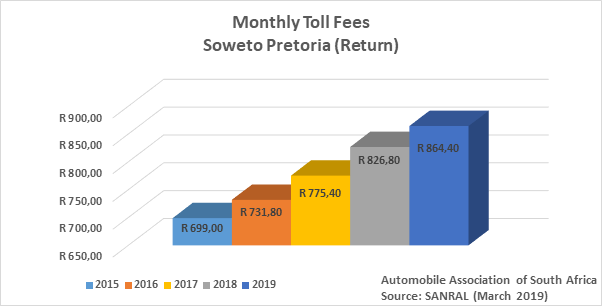 By increasing these tolls SANRAL is, essentially, punishing the 30% who are already paying, instead of trying to find a new way forward for all road users and to bring the remaining 70% of non-payers into the fold,” says the AA. The Association says, given the different messaging around e-tolls in Gauteng, there is a need to fast-track a process which will bring a uniform policy approach between the provincial and national government on the matter. “Clarifying exactly what the way forward is for e-tolls is critical, especially given that are significant differences of approach between different structures. This is leading to substantial confusion among the province’s road users,” says the AA. According to the AA the increasing costs associated with road travel in South Africa will make everything more expensive, and will certainly have a direct and indirect impact on consumers. “It also makes it harder for job seekers to find work as few of them have the resources to pay current transport costs, let alone increased fees. This, in particular, is worrying given the country’s high unemployment rate,” says the AA. 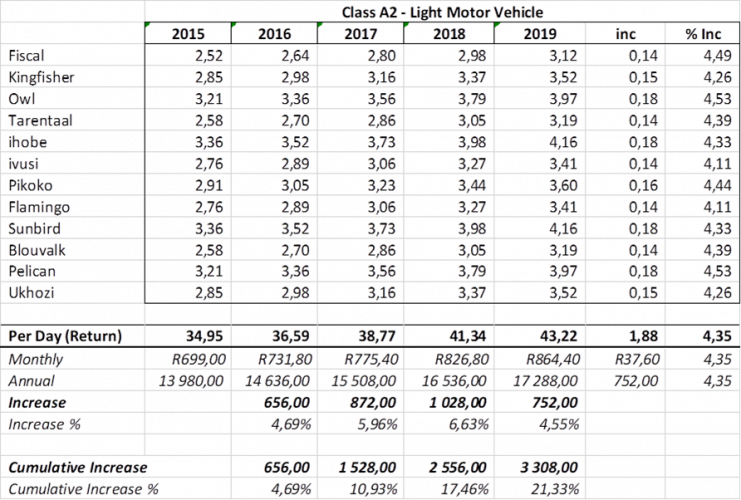 For illustrative purposes, below is a breakdown of current and historic rates, as well as the financial impact for a day trip, on the GFIP from Soweto to Pretoria. This trip will cost the consumer an additional 4.35% in tolls from March 2019 compared to March 2018. This represents a R43.22 increase from R826.80 to R864.40. Since 2015 this has increased by R165.40. NOTE: These tariffs exclude monthly caps were applicable.